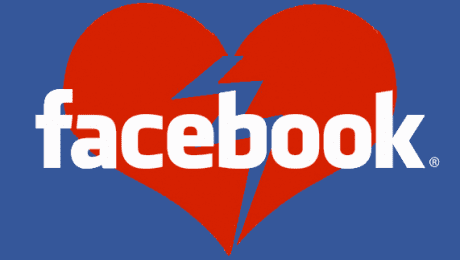 Many people think about breaking up with Facebook regularly. More people since the Cambridge Analytica information has come out. Personally I have been starting to question its value to me personally for some time now. 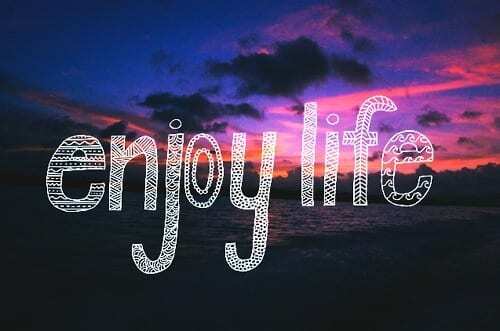 Originally, I started the account to “stay in touch” with friends and family. Then I used it for some time to promote my fitness “business”. I was also a secondary admin to my wife’s Business Page there as well. So when it came time to finally make the break-up happen I had to do a bit of work to make it actually come to fruition. While it is simple to deactivate your account I wanted to see in stages what would happen with various aspects that might break. NOTE: We all know every social media platform collects data, and yes I still am on others I need for work, but my long term goal is to eventually be off them all when I no longer need to be. First things being first, many people have no idea just how many applications are connected to their account. All those new websites that want you to login give you the option of using an E-Mail address or now, Facebook, Twitter, or Google for single sign-on. In order to know what you may lose access to and to restrict access by all those wretched games you might play, go to the App Settings under Setting—>Apps and review your connected apps. You can with a single click nuke them all by turning off the setting under “Apps, Websites, and Games”. By changing this it will instantly remove access from all connected apps. If you wish to maintain connections to some but not others you can selectively remove them in the top section. Once you do this you may have to run for a week to see if any sites you frequently use need to change login type from Facebook to E-Mail. The challenge here is if you connect to Pages as an admin some apps may need to stay connected. I will discuss what I did to solve that problem differently later. let’s face it. Facebook has the most value to the marketers that pay for ads and as we have learned and as many marketers know, the data Facebook collects about your likes and shares translates to marketing data about your “Interests”. One place you want to examine is the Ad Preferences section under settings—>Ads and examine ALL the sections but in particular the ones I have highlighted. In particular you want to turn off everything under “Your Information” where there is both “About You” and “Categories”. Just remove everything there, and also disable the options under “Ad Settings”. You can also remove items under “advertisers you have interacted with”, but just look at all the “Interests” that have been assumed about you and collected. 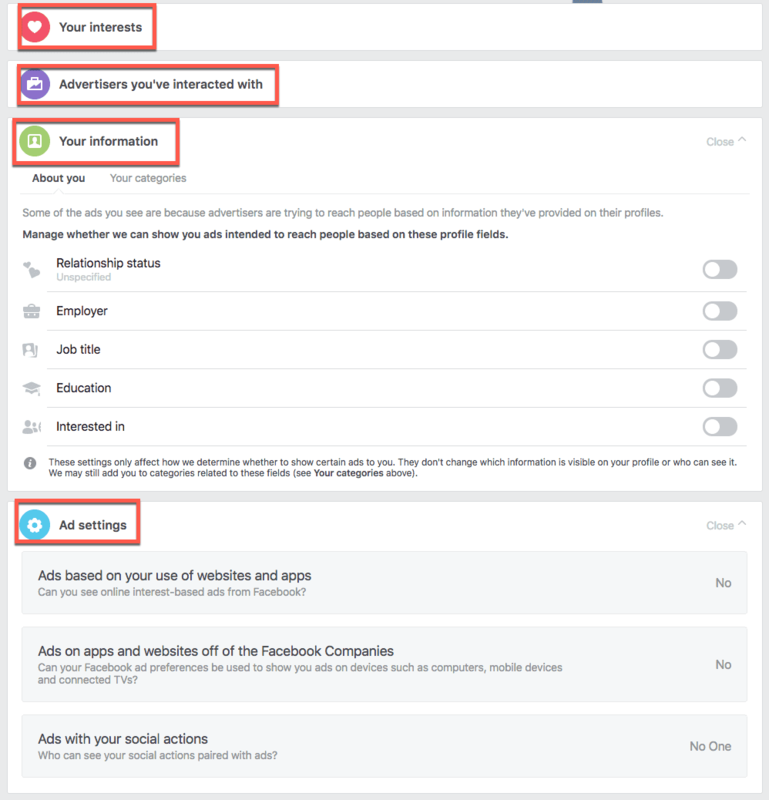 So you know, those are all interest options marketers can use to target you for ads. I am sure your list will be pretty long, and even if you remove them all, new ones will crop up like roaches. All you can do is the best you can here to limit the use of the data, it will not stop it from being collected. Understand every time you share or like a post or a Facebook page that generates some assumptions about your “Interests” in this area. You can’t escape it unless you unlike everything and stop liking and sharing things. This is what makes Facebook money, advertising so if you want to hit them where it hurts be diligent about disabling these things and stop sharing every political post that may or may not be real, or silly meme you are just giving them more data. This is pretty widely covered on the internet how to do it, but simply put, do it. Get your data back but understand photos will be pretty low quality. In some cases people with android devices have also noticed their call logs were part of the FaceBook data download. It’s under the General Settings option. Yes, I said it. After all this I am saying to go create a new account under a business E-Mail address that you can use to manage the Facebook Page for that business. The difference here is you know now what to disable. Also I did not “Friend” anyone on the new account. I don’t post, share, or like anything. That account is used as a means to an end for business apps to connect via the user to the page. 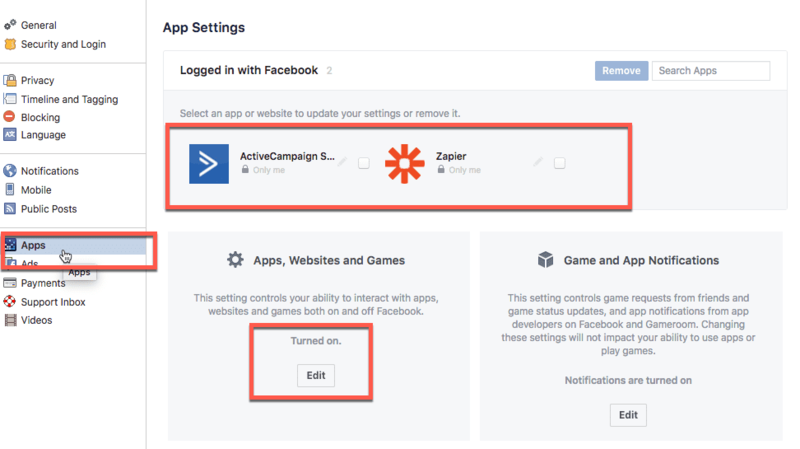 Such applications like Zapier need a Facebook login to then administer a page to perform actions. I am fine with that, but it’s like having a “Service Account” that is used to access the page. The actual feed and wall are essentially never used so little to no data will be collected. I even filled out the bare minimum on the account profile to create the account. It is important to do this before the next step as most likely you will need the current account you are going to deactivate to add the new one as an admin of the same pages. If you don’t you will have to reactivate your original account to add the new one. This is the final phase in the process and I have read and heard people talk about both. If you disable your account you can actually still use the Facebook Messenger app without it re-activating your account. However, if you hit a website that used your Facebook login and you don’t change it and just click “login with Facebook” that will re-activate the account. You need to be careful about this and the “Delete Account” option. 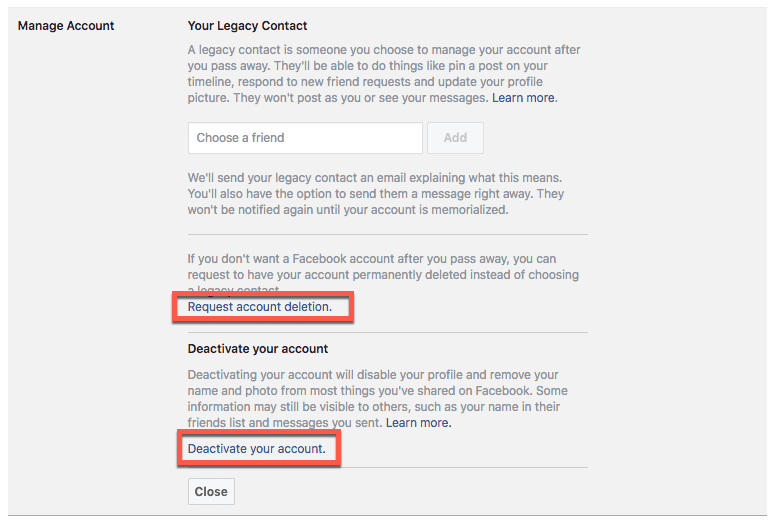 Once you delete it, Facebook can take up to 90 days to remove it. Also I have been told that deleted accounts can become subject to identify fraud. You can manage this in the general settings under “Manage Account”. NOTE Regarding Messenger: Disabling your account will still allow you to use messenger without reactivating your account. I have yet to see if that still works if you completely delete the account. Seriously, I have gotten more done in the weeks since disabling the platform than I have in months. You might have a little bit of withdrawal, but that will soon pass. You will be okay when it passes. Next Step. Find a Facebook like app (like Albatross) that’s PW protected or that Fam can sign up for, with intent to Host pics/videos of Fam and be accessible only to them or SMS’d/email’ed updates based on how they want to receive an update. So then, I can post Kid pic and they will all get to see and no one gets left out. Possibly. Just haven’t found a good Opensource option. Or web option yet.